It's been said we don't remember days — we remember moments instead. Whether it's satisfying a curiosity as as life long learner, or working through a bucket-list for bragging rights, travellers from all walks of life are really chasing those once-in-a-lifetime moments at the heart of it. From the historic cities and towns of Europe to the exotic islands of Japan and South-East Asia, the intimate and inspiring adventures that comprise the APT Small Ship cruising program are tellingly packed to the bridge with such moments and seldom-seen treasures. But don't take our word for it. Read on as two APT guests and a Guest Lecturer describe a few moments they experienced — in some of the world's most exotic and sophisticated destinations. We left Venice in glorious sunlight and cruised down past the St Mark basin doing no damage to the ancient piles on which the city is built and from which the larger cruise vessels are now to be banned, none too soon! We have brought that glorious weather right down the Adriatic, painting the churches of Zadar, the walls of Dubrovnik and the Imperial palace at Split with painterly light. 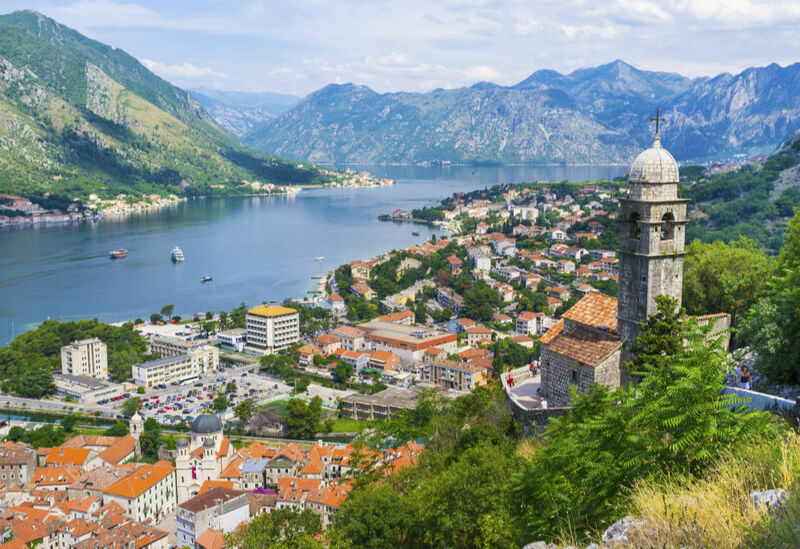 This image: Part of a wider World Heritage Site, Kotor is located in a secluded part of the Gulf of Kotor, Montenegro. There have been magical moments apart from the weather. A memorable one was the sail out of the Fjord of Kotor in Montenegro, where we had spent an enchanting morning in the marble (formerly Venetian) passages of Renaissance times. We were passing the tiny twin islets of St George’s, and the artificial island a few metres away, Our Lady of the Rocks. The latter owes its name to the magical appearance on a rock of an icon of the Virgin Mary, which was discovered and taken to the church in nearby Perast on the bank of the fjord. The next day the Virgin was back on her rock – and when they checked, also in the church – so the local sailors and fishermen began to drop rocks and wrecked boats around the rock creating the present island. It is now occupied by nuns, with whom we exchange signals each time we pass. The passengers were somewhat alarmed as the captain sounded three long blasts on the ship’s horn, but delighted when the nuns rushed into their campanile to give an answering peel of bells. Your Adriatic & Aegean Odyssey small ship cruise includes 14 nights on the MS Island Sky with all meals and drinks on board, a range of shore excursions, all tipping and airport transfers. Japan has been a revelation of amazing sights, beautiful people and friendliness. Wherever we arrived we were greeted by welcoming ceremonies – from folkloric to modern dances, formal speeches and dragons, it was a kaleidoscope of what Japan has to offer. What stood out the most were the spectacular Japanese gardens we have visited. We were lucky to have caught the ending of the cherry blossoms and we were just in time for the peony festival in Matsue – what an incredible sight that was! A lake literally covered in peonies just to be admired. in Hagi during the olden times. This image: The "floating" torii gate or Itsukushima Shrine, a Shinto shrine located on the island of Itsukushima, Japan. Today we enjoyed an origami lesson with our guide, Hide. It took us more than half an hour but we finally finished the cranes which we were folding to hang up at the peace memorial in Hiroshima. And to top it off, the crew of the MS Caledonian Sky performed a crew show, showing off their various talents and sense of humour. The cruise is slowly coming to an end, but the highlights of Japan are not. We have another two wonderful days on board and hope that the weather gods will keep being with us for the next days as we will use our Zodiacs to go ashore in Miyajima, which I’m looking forward to. Your Sailing the Japanese Isles small ship cruise includes 14 nights on the MS Caledonian Sky and 3 nights at the Brighton Hotel in Kyoto with all meals and drinks on board, a range of Freedom of Choice shore excursions and APT Signature Invitations and airport transfers. We arrived off St. Kilda, which loomed at the last minute out of the mist, before heading into Village Bay on the island of Hirta. Although it was misty the seas were calm, and the Captain manoeuvred the ship right in close to the settlement. The view spread out in front of us was spectacular, with sea cliffs along the coast, steep hills in front, scattered ruins of the original village of the settlers and little dark brown Soay sheep that are unique to this area. Once ashore we were greeted by the warden who chatted to us before we either wandered off by ourselves to explore this fascinating place or with Jamie to climb up the hillside to the Gap, a shoulder above the sea cliffs. As we meandered through the ruins and stone walls (built to keep cattle out of cultivated areas), we discovered how the early settlers survived in this remote location. 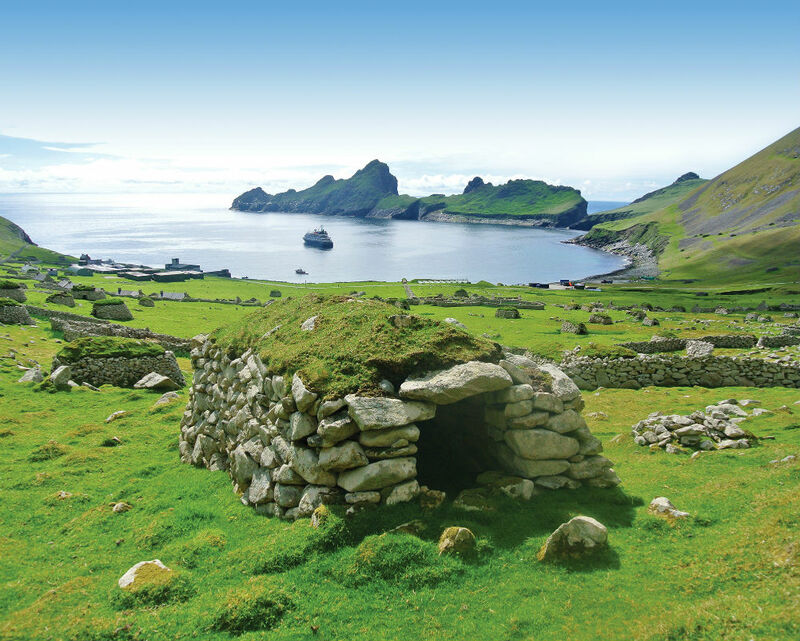 This image: A cleit above Village Bay on the isolated archipelago of St. Kilda, Scotland. After lunch the mist lifted obligingly. We were offered an hour-long zodiac cruise along the dark gabbro (volcanic rock) cliffs of Dun, looking through the natural arches to have a taste of the swell on the west side of the island. As the breeding season is in full swing, there were fulmars, kittiwakes and huge numbers of puffins. Several grey seals kept poking their heads up to watch us drift by. Later, we joined the Expedition Team for our recap and briefing before dinner. Your Britain & Ireland Explorer small ship cruise includes 11 nights on the MS Hebridean Sky with all meals and drinks on board, a range of Freedom of Choice shore excursions and APT Signature Invitations and airport transfers.